This cute skydiving "flying" squirrel shirt shows a funny cartoon squirrel wearing skydiving equipment. Drawn by Joy Kolistsky and available in many colors for men and women in her RedBubble shop. 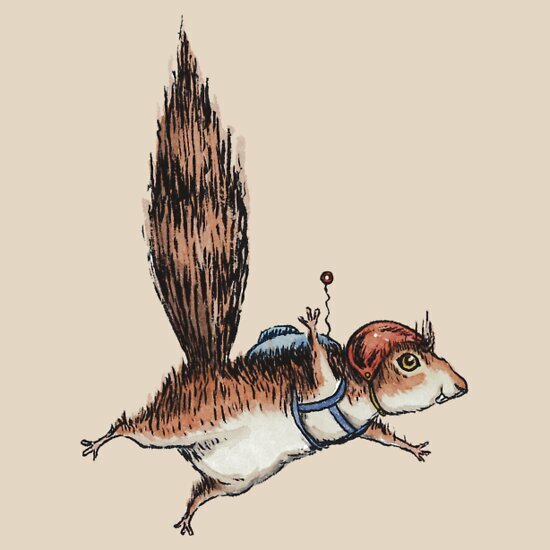 This shirt sports an excellent illustration of a happy squirrel who has just jumped from a plane. Why is he skydiving? Because not all squirrels are flying squirrels...but many wish they were. He's wearing bright-colored skydiving garb and has assumed the dive position, much like his flying squirrel cousins. What makes this squirrel drawing so great? A few things. It has a skillful hand-drawn and hand-painted quality that differentiates it from many of the digitally-produced squirrel designs on the web; It successfully makes clear which type of rodent is depicted thanks to the bushy tail; It conveys a forceful sense of joy and exuberance. Finally, it combines all three conditions in an original setting: a skydiving squirrel. It is available as men's and women's t shirts, but also as hoodies, longsleeve t's , and baseball 3/4 sleeve shirts.